Any ladies out there running in Saucony Kinvara’s? I’m a Saucony loyalist and got a GREAT deal on a pair of Kinvara 4s. Each new pair are getting a bit more minimal. 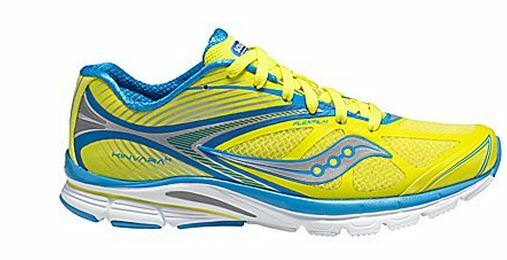 Though the drop is same as my Mirage 3s (4mm), WOW … these Kinvara 4s are LIGHT!!! Can’t wait to try them! Any feedback if you’re currently running in them appreciated ……. I run in them. I ran my first half marathon in them. I loved them! Great fit and they felt great on my feet. I’m not a lady but I love the man’s version. I just bought the Kinvara 5 and they are actually a little more cushioned than the 4’s. I did two half marathons in the kinvara 4. Yup I love mine. They tore at the small toes in each foot pretty quickly but they have been the most comfy! I’m in asics gels now. I love them but I need a new pair. Where did you get the deal? I just recently got some kinavara 4’s. I was using guide 4’s. I love the kinavaras, the switch over was flawless. Amazon.com … $48 (free shipping with my amazon prime). I’d rarely ever buy shoes without fitting but … I know Saucony’s like my feet and I couldn’t pass them up! I tried them on and they feel good. Will take them on a short run in the morning. and I don’t even mind the color!! I’m not a huge fan of super bright/neons. I’ve always been a saucony fan. I had Kinvaras, so I was happy to get the 4’s. I do not like how the heel is higher and stiffer. So, I tried them out this morning on a 4-mile run. Felt good! Super light, a bit stiff. Only complaint: what Tracy said …. top of the heel on the left side was rubbing. Not enough for a blister but if I’d gone any further, it would have been. Verdict: I think they’ll be great shoes for short runs and/or speed work but … not sure I’d use them for a half. It hasn’t softened up in the months I’ve had them either and rubbed my heels raw yesterday on a 4 m run. So, what about the 5’s? Did they modify them? I haven’t checked into it. This entry was posted in Question and Answers by Runners, Running Shoes and tagged Saucony Kinvara.